West Hollywood’s Planning Commission unanimously approved plans for a six-story residential and retail building to be built on the site of the Faith Plating plant on Santa Monica Boulevard at North Formosa Avenue, despite worries from residents about the clean-up of toxic chemicals on the site. “We have to trust the experts,” Commissioner John Altschul said about the clean-up concerns. Of the 22 residents who spoke during the two-hour hearing, most favored the project but worried about the removal of soil contaminated by heavy metals used by Faith Plating, which since 1935 had been one of the world’s largest replaters of chrome automobile bumpers. “The level of contamination is not as extensive as once thought,” testified Joe Frey, founder of the Newport Beach-based Frey Environmental, Inc., which will be in charge of removing the contaminated soil. He said there will be no chance of spillage as they remove and transport the hazardous waste. Frey explained the soil on the site was mostly clay, which is far less porous than sand. That means that very little of the toxic chemicals had seeped into the ground water. Tests indicate the contamination stops about 10 feet beneath the surface, he said. Commissioner Roy Huebner assured the concerned residents that the state Department of Toxic Substances Control (DTSC) has stringent guidelines for the clean-up process. Commissioner David Aghaei suggested that leaving the site dormant would likely be more dangerous than attempting to clean it up. Once the Faith Plating building has been demolished and the soil cleaned up, the new building, which will go by the name “Domain,” will have 166 residential units (33 of which will be affordable housing) and 9,300 square feet of retail space at street level. The building will be six stories high (72 feet) on the Santa Monica Boulevard side, but only three stories (36 feet) at the back of the lot, which is next to low-rise residential buildings. Several residents expressed concern about the number of projects simultaneously going up on the city’s eastside, and wished the Domain project could be slowed down. A six-story mixed-use project is going up at the old Carl’s Jr. site (on the northwest corner of Santa Monica Boulevard and La Brea Avenue) and another six-story mixed-use project is being built on the old Jon’s supermarket site (southeast corner of La Brea and Fountain Avenues). Additionally, a mixed-used project that includes two seven-story towers and 26,000 square feet of commercial space is proposed for the Movietown Plaza site (on Santa Monica Boulevard at Poinsettia Place). However, the Domain project won’t be “shovel ready” for several more years, according Altschul. The two buildings on La Brea are supposed to be completed by then. Other residents said all the new construction was a positive for the neighborhood. “It’s an exciting time to live on the eastside,” said resident Steve Levin. marco, your linkedin profile says: “Residential Property Management, Leasing Specialist, Project Management, General Contractor, Real Estate” ——so of course you have no issues with it!! !….are you an investor perhaps?? Thank you Steve, Todd and John for your factual, intelligent and perceptive observations. The Domain is a brilliant addition and sets a new standard for innovative architecture with respect for neighborhood and community. Here is inspired design with consideration of local landmarks like Formosa Cafe and the incorporation a portal to view the legendary Hollywood sign. As for those calling these over scaled developments, I am confused? These are six story complexes located on commercial, mostly neglected parcels along Santa Monica Blvd near La Brea. To some, the glass will always be half empty and logic will not ever be a part of their objections. So yes, assume and expect traffic on SMB, please slow down, be sure to stop at pedestrian crossings and appreciate that we are all safer when in Weho. Another 6 story development inserted into the already congested SMB and LA Brea. Out Of Town Money Bought The Last Election. Who Owns Weho at this point? The Urban Village is for sale to the highest donator to city council re-election accounts. UGH, how many oversized developments are going to be approved by the weho city council on the eastside??? ?…..we’ll have to avoid traveling east altogether due to massive gridlock….first they totally neglect the eastside for decades, and now they’re creating mini-manhattan…..notice how the council never approves over-scaled developments in THEIR neighborhood???? Well, that’s what happens when the STRUCTURAL DENSITY of a place doesn’t keep pace with a rising population. From a sprawl perspective, as our population grows, if we don’t build up expect more people to drive more everywhere. Don’t convolute the necessity of these projects! Snarkeygal, you do realize that limited housing stock increases rents yet? Or you never took basic economics? 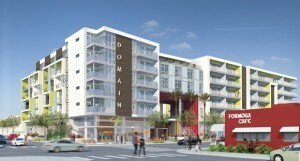 mixed-use developments–and YES, many of us love the architecture of DOMAIN. security of our neighborhood which will reduce crime and prostituition. individuals and those living with AIDS. – Additional traffic mitigation measures to improve traffic flow. – More shopping and dining options to make us less reliant on driving. – No more bars on windows. – Not being afraid to walk on my street after 10pm. – Not being woken up every night by loud parties or gun shot sounds. – PARKING!!! Yes, parking is much much better. – Finally, some decent restaurants. – Dramatically increased property values. I’m at a loss to understand your logic, especially having lived here for 35 years. Please tell me a single thing that was better 10 years ago. Steve, how are all these big new developments making the East Side a great neighborhood? I am at a loss. I don’t understand your logic. I’ve lived on the East Side for 35 years, and all I’ve seen in increasing rents and traffic. I don’t see how huge buildings that will block the sunlight, with rents that will be unaffordable to most that already live here, is good for us? More restaurants and empty storefronts? Whoopeeeeeeee!!!!!! If you mean kissing goodbye the toxic laced, prostitute infested, transient occupied Urban Village that I’ve live in for 13 years, then Yes, I suppose I will happily kiss it good-bye. Finally, the east side of West Hollywood is becoming the great neighborhood I always hoped for. In addition to the many exciting projects you wrote about, don’t forget that the La Brea Streetscape project will be starting up soon which will make La Brea between Romain and Fountain uniform with the design of Santa Monica Blvd. As for those complaining about traffic on Formosa and Detroit currently being horrible. That is an outright lie. Formosa happens to be one of the widest “neighborhood” streets in the city and traffic has never been a problem. Detroit with it’s angled parking is also never a problem. And with the many mitigations planned for Formosa and Detroit, traffic will be only minimally impacted. Most important is that finally we will have new retail and restaurant options available making car trips less necessary for local residents. This is great news and the neighborhood will only benefit from this. A small edit…Movietown Plaza is TWO seven story buildings plus a SIX story. There is also a housing project between the Jon’s market site and the Carl’s site. Just south of the gateway, there is a proposed 500 unit site in LA and across the street from that where Jerry Solomon’s was there is renovation going on. The Los Angeles residents are already complaining about the fact that SMB is too crowded so cars are dropping down to Willoughby and Waring to cut through their neighborhoods. They are saying they should start complaining to West Hollywood. Also, no one mentioned the SIX stories proposed at the LOT. It will be a canyon in no time. It’s like Sherman’s march to the sea, only this time it’s the march THROUGH Sherman Kiss the Urban Village good-bye. It will now be Urban-Urban.